The Malaguista winger analysed the team’s situation following the match in Madrid: “We’re not having much luck in front of goal, but we’ll carry on until the end with the five remaining matches, nobody should leave us for dead”. “We’re not having much luck in front of goal, but we’ll carry on until the end with the five remaining matches, nobody should leave us for dead. There’s still life. There are five games left and we’re going to give our all. We need to rectify our mistakes and will give everything we’ve got for the coach”. “Having a capacity crowd at the Federación will be key. We’ll do all we can for our fans as they are always there cheering us on”. “The good thing is we’re going to play to stay in the elite at home, united. We’ll also do everything we can to win the last two away games, as it doesn’t matter if we’re facing Lezama or Barcelona, I believe it can be done”. 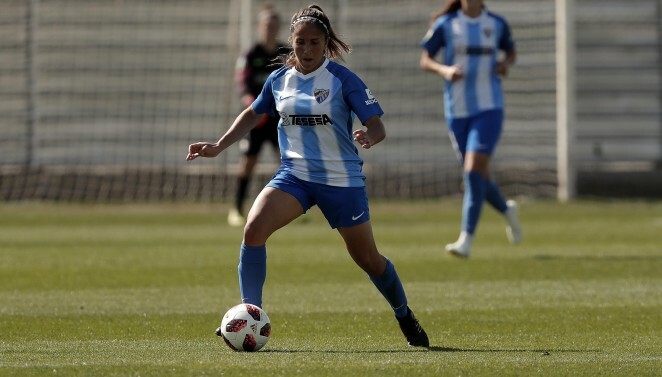 The Málaga CF Femenino defender spoke to MCFFTV in the run-up to #MálagaSportingHuelva and highlighted the importance of the fans. “We need all the support of Malagueños and Malagueñas, they are a very important factor”, she stated. The Málaga CF Femenino defender appeared in the mixed zone after #BarcelonaMálaga to analyse the team’s situation. “We knew it would be a difficult game, but we’re now focused on the match against Sporting Huelva”, she said.